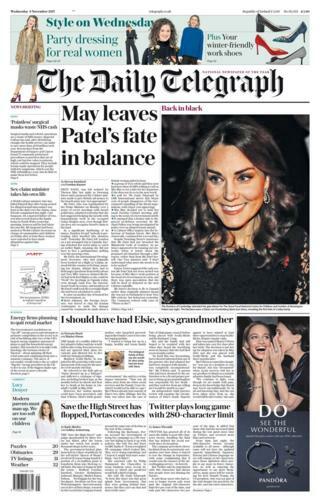 The future of International Development Secretary Priti Patel remains “in the balance”, according to the Daily Telegraph. It says she has been left “isolated” by Downing Street following the row over her meetings in Israel. 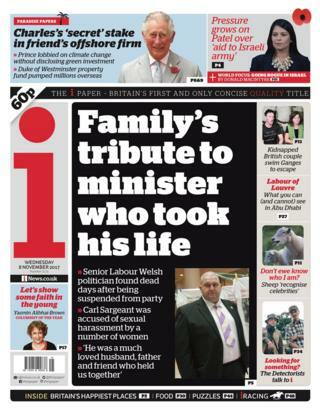 The i newspaper is one of a number of newspapers that lead on the death of Carl Sargeant, a senior Labour Welsh politician, who was found dead on Tuesday. It leads on his family’s tribute to him. 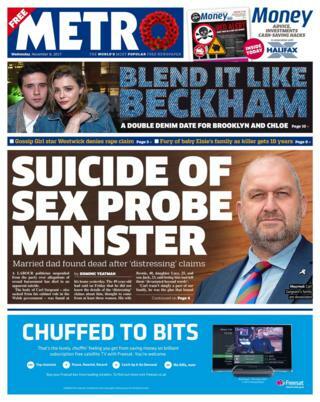 The Metro also leads on the death of Mr Sargeant. It says the body of the ex-Welsh minister was found at his home and that his family is “devastated beyond words”. The Daily Star also leads on the same story, saying Mr Sargeant is believed to have taken his own life. 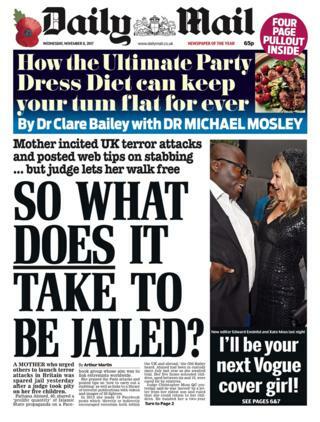 Its front page headline makes reference to the fact he was sacked last week following allegations of misconduct. Mr Sargeant’s death also makes the front page of the Sun. It says the politician died after “begging” party bosses to provide him with further details of the allegations against him. The Daily Mirror splashes on news the BBC is investigating 25 allegations of sexual harassment after victims came forward in light of the Harvey Weinstein scandal. 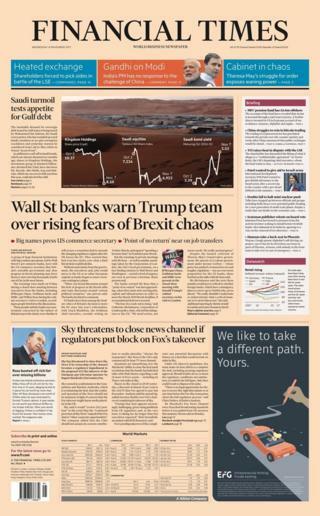 American financial institutions, led by Wall Street banks with big London operations, are warning the US commerce secretary that slow progress over Brexit may force them to start moving jobs away from the UK, the Financial Times reports. 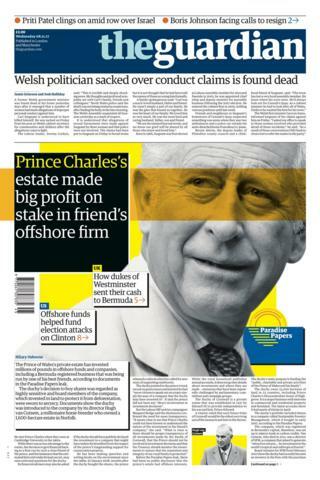 The Guardian continues to give over its front page to the so-called Paradise Papers, with Wednesday’s splash focusing on Prince Charles. It says the prince’s estate made a “big profit” from a stake in a friend’s offshore firm. Labour councils are using offshore companies to avoid paying millions of pounds in tax, the Times says. It accuses Labour leader Jeremy Corbyn, who spoke out about those caught up in the Paradise Papers, of “hypocrisy”. 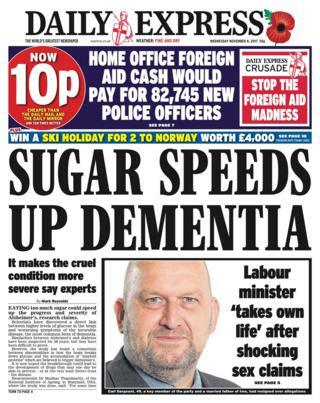 And finally, eating too much sugar could speed up the progress of Alzheimer’s, according to the Daily Express. It says scientists have discovered a direct link between high levels of glucose and the most serious forms of dementia. The papers make uncomfortable reading for International Development Secretary Priti Patel. The Daily Telegraph says she she has been left “isolated” by Downing Street, which has significantly hardened its stance towards her secret meetings with Israeli politicians. It says her deputy was left to defend her in the Commons yesterday after she took an earlier flight to Uganda – even though her staff took the overnight flight she had been scheduled to catch. Using a pun in its headline, the Sun describes her position as “Priti fragile”. The Guardian agrees her future is “increasingly precarious”. It says she didn’t just make a lazy mistake. Instead, according to the paper’s editorial, she “did something seriously wrong, deliberately, a dozen times, for suspicious reasons”. 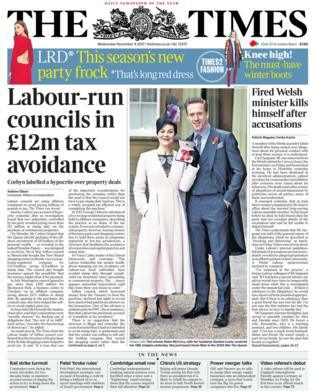 The Times says two Labour councils have used offshore companies to avoid paying more than £12m in stamp duty. It says Sefton Council in Merseyside bought a shopping centre via a firm registered in Luxembourg and Warrington paid for a business centre in Cheshire via an offshore company. Liberal Democrat leader Sir Vince Cable says Labour’s stance on tax appears “somewhat hypocritical”. The paper points out that what Sefton Council did wasn’t illegal – and the local authority tells the Times the vendor was only willing to sell the holding company, rather than the shopping centre itself. Warrington says the purchase of the business centre would have been delayed if it had tried to complete the deal onshore. Away from the UK, US President Donald Trump’s visit is the main story for most of the South Korean papers. The Chosun Ilbo newspaper pictures him and President Moon Jae-in sharing a handshake. It says the US President re-assured the South Koreans that he wouldn’t “skip over” them, as he tried to tackle North Korea’s nuclear threat. But another South Korean paper, the Dong-A Ilbo, reports the American president discussed US military action in the event of an emergency when he met Japan’s leader. Con Coughlin, writing in the Telegraph, believes Mr Trump’s tone is “more conciliatory” and the reason he’s able to take a softer line with North Korea is that sanctions are starting to have a serious impact on their economy. Several papers report that official statistics on wellbeing show that happiness levels have reached a “record high” a year after the Brexit vote. The Daily Mail is among those to highlight the a survey showing an improvement in satisfaction and a reduction in anxiety since June 2016 – although the Office for National Statistics suggests high employment may have contributed. The headline writers have some fun with the research showing sheep recognise people’s faces.